On 14th October 2016 was successfully held the project's National Conference in Sibiu (Romania)! The Conference was organized by Association for Liberty and Equality of Gender (A.L.E.G.). Participants of the National Conference were mainly teachers and adolescents as well as key stakeholders (e.g. the counsellor of the Ministry of Education, Mr. Eugen Crai, and the State Secretary representing Ministry of Labour’s National Agency for Equal Opportunities between Women and Men, Ms. Andra Croitoru). In addition, the implementer and children/adolescents from each of the 11 implemented workshops participated and presented their workshop’s results and their experiences. More than 70 participants attended the conference! 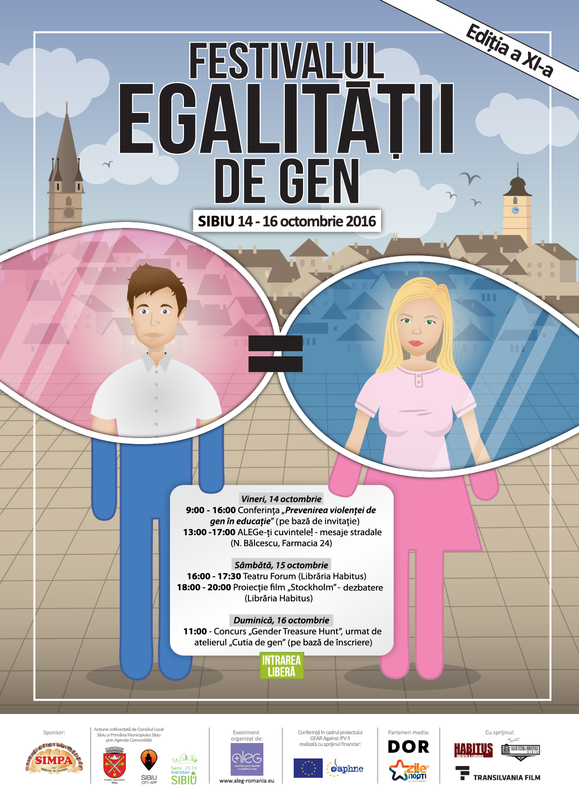 The Romanian National Conference was part of the Gender Equality Festival, an annual education campaign that A.L.E.G. has been organizing since 2004. The conference was mentioned in the official programme of the Festival, including on the Festival poster, but also on the A.L.E.G. website (articles in both Romanian and English), on social media and on other online and printed publications (mostly in Romanian) which took on our articles, press releases and posts.